Ortus Regni (http://www.ortusregni.com/) is a new and novel card game inspired by the late Anglo-Saxon period of English history. A time of warring Earls, claiming whatever lands they could… establishing fiefs, cultivating powerful vassals, fighting and engaging in endless political struggles. All while Vikings roamed not just the sea, but the land. It is truly a Dark Age. Or is it? Lasting for 600 years, until the Norman Conquest of 1066, this era decided the future of a great kingdom that would become England. Designing your Earl Deck before play begins is one of the key features of the game. Ortus Regni is a deck-design game, rather than a deck-building game. That is, you are entirely in control of the deck that you will begin play with in a game of Ortus Regni. There are several canonical Ortus Regni deck design concepts—such as a Lord deck, an Army (Land) deck, a Politics deck, or an Emissary (Monk) deck, and more. But such concepts are only the start of your design options. The Earl Deck you put together can be a subtle hybrid of several concepts, or something entirely different and unusual. Your opponents in Ortus Regni will have access to the exact same suite of cards that you do when they design their own Earl Decks for game play. So it all comes down to your choices and your strategies! There is also tactical space during a game of Ortus Regni to zig and zag, even if you find yourself against an Earl Deck design that you did not anticipate. You might pull out an unexpected win nonetheless if you play your deck well. Luchador! Mexican Wrestling Dice is a two-player dice game (with optional rules for four-player tag-team play) based on the popular world of professional Mexican wrestling, or “Lucha Libre” (a.k.a. free fighting). Players start with 21 points of health (or 18 in a tag-team match) and roll custom dice to try to either reduce the opponent’s strength points to zero to win by a knock-out (KO) or hold the opponent down on the mat for a “count of three” to win by a pin. The player sitting near the ‘red’ corner of the wrestling ring uses 4 ‘red’ wrestling dice, the player near the ‘blue’ corner, the 4 blue wrestling dice. Players begin by each rolling their own set of ‘wrestling dice’ at the same time, trying to ensure that they land in, or touching the wrestling ring. If a player rolls two HITs in one round, instead of rolling the HIT dice twice, they can take a chance on the Luchador! die once which may result in their wrestler’s trademark moves and inflict much more damage on their opponent. Any PINs rolled in a round may be re-rolled, once only. However once an opponent is reduced on their strength to where they are pinable, the PIN die is held until after the HITs have been inflicted then the PIN die is rolled. If PIN comes up, the ‘three count’ begins. The player being pinned has three attempts to save, using their wrestling dice or lose the match. In a tag-team match players have the choice of trying to tag-out to regain slight strength, but it can also cost them…, if they fail to tag and get dragged back into the ring by their eager opponent. In The Great Fire of London 1666, the players are men of wealth and standing who own property around London. The Lord Mayor has failed to act and it is down to these mighty men to lead trained bands of militia to fight the fire and save the city. To do so they must decide which districts to sacrifice to the fire and which to protect. Remember, these same men own much of London, thus such choices will shape their own future and greatly affect their wealth and standing. The Captain is Dead (publisher link) is a co-op game for 2 to 7 players. All you have to do is get the ship’s engines (aka “Jump Core”) back online and you win; but because there is a hostile alien ship trying to destroy you, that is easier said than done. Till Dawn comes in a coffin-shaped box with approximately 120 cards, more than one hundred tokens, eight character cards, and a “night advancement” track. It’s August 1981 in the midst of the Air Traffic Controller Strike. President Reagan has just ordered all controllers back to work. You determined to keep your job, have returned – only to find the situation is even more turbulent than before: more planes, less controllers, and high competition. Seems simple right? Not exactly. Rotating and Swapping can only be done if your planes are touching the tiles. The more planes you have on the board, the more power you have. In the mean time your opponent will be trying to get their planes in and pushing or crashing (yes you can collide into other planes) to prevent you from getting there first! 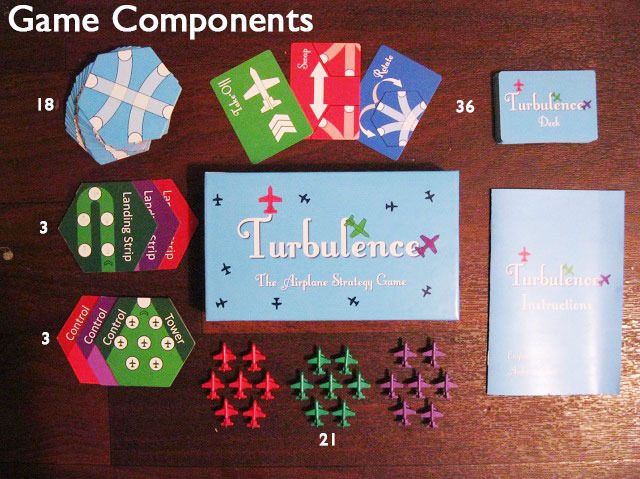 You’ll be swapping, pushing, rotating, crashing, landing, taking-off, and triple pushing in this game of TURBULENCE.